I was lately looking for something fun to watch on an afternoon, and decided after browsing Netflix to give When We First Met a chance. Partially the premise was interesting, but also I wanted to see if I could repeat the magic of Netflix’s To All the Boys I’ve Loved Before. And while I think that was a better movie, I was pleasantly impressed by this one too. A time-travel romantic comedy, I freely admit this premise had the potential to be a little bit skeevy. Noah has been carrying a torch for his friend Avery for three years, and hits rock bottom at her engagement party to Ethan. He’s convinced that if he could just go back to the night he and Avery met, a Halloween party where they shared an instant connection, he could get it right this time to start a romance instead of a friendship. Thanks to a time-travel photo booth, he gets the chance to try, traveling back to that fateful night. Repeatedly. There’s a little bit of Groundhog Day here, in that Noah keeps reliving the same night and trying to do something different each time, but with a very cool twist. After each Halloween party, Noah bounces back to the present, the morning of Avery’s engagement party, and gets to see the effects of the choices he made. His life (and Avery’s life) becomes radically different each time depending on how that crucial night went. Not too surprisingly, he makes everything worse the first time. And the second time. And… You get the idea. I loved seeing the (admittedly slightly exaggerated) effects of his choices as each possibility plays out. The potential for skeeviness here lies in a couple things. One is that we meet Noah when he gets fall-down drunk at the engagement party, and nothing much sets him up as a particularly appealing guy, for Avery or anyone, in the first portions of the movie. However–as the movie goes on we see more sides of him, plus he learns and grows from his various adventures into the past. Second, there’s something inherently skeevy in a guy trying so hard to “make” a woman who clearly isn’t romantically interested fall in love with him. But that’s where I wound up impressed by the movie. I don’t want to give too many spoilers, but there was a nice twist perhaps two-thirds of the way through that wound up to a very satisfying conclusion. It played with the traditional romantic comedy narrative, and ending up drawing the opposite message from where the premise looked like it could be going. Okay, spoilers: Noah never does get together with Avery, instead finally realizing that his insta-love attraction didn’t have anything at its heart, and she was totally right in feeling that there was no romantic spark between them. Since insta-love is one of my LEAST favorite romance tropes, I enjoyed that a lot. And there’s a slow-burn romance going on in the background that leads to a happy ending for Noah anyway. 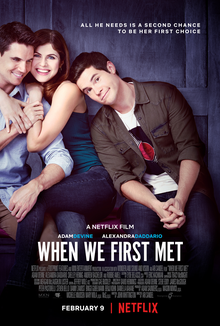 What I found especially interesting is that this is the second Netflix film where I wound up thinking, huh, this was really innovative and surprisingly healthy and why aren’t all romantic movies doing stuff like this? I’m also a fan of Netflix’s Series of Unfortunate Events and Grace and Frankie. Anne with an E, on the other hand, was a little bit of a mess. So I guess it’s not 100%, but I’m still liking the direction of whoever is making decisions on Netflix films. I was also pleasantly surprised by this movie! And I agree with your points about Noah’s character…for the first half of the movie, I wasn’t sure I was going to like it, but I really enjoyed the twist you mention and everything that occurred after that. I also love that Ethan, Noah’s “rival,” is a genuinely super nice guy, not a two-dimensional villain. Have you watched Netflix’s “Set It Up”? Also a very fun rom-com, if you’re looking for that kind of thing! It’s good to hear that Netflix is producing new rom-coms, and that they have some promise for their storylines. Rom-coms in theaters seem to have disappeared of late.